Sorry, I’ve been away for some time. It had a lot to do with the my shift to WordPress and hosting it externally. It’s all new to me and learning it the hard way. Ahhh! your luvly cats and nice oics and stories too about them. Thanks for the post! We are getting ready to move our city cat down to Costa Rica! 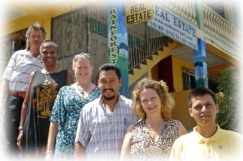 We are planning to retire in belize. When we bring our cat ( he’s an outdoor fair weather hunter), will we have to leave him in quaritine. I don’t think we could survive that. The procedures are quite simple as all you need is a valid import permit from BAHA (Belize Agricultural Health Authority) the Belize government department handling these matters http://www.baha.bz/. This page http://www.baha.bz/animal_health.html has 2 links; one to “The Procedure for the Acquisition of Import Permits” and one is the actual Application Form. To contact them I “highly” recommend phone, not email. Gov Depts in Belize are really bad at responding to emails! Oh please people! Do the native flora and fauna a favor and don’t take cats to sensitive wildlife habitats. Bird populations are declining and outdoor cats rank among the top ten reasons.